Depending on the boat it graces, the new powder-coated Primus steering wheel from Schmitt & Ongaro Marine Products can be tactical, race-inspired, sophisticated or rebellious. Made from cast stainless steel with a deep, rich, durable powder coated finish, the bold look instantly becomes the focal point of any dash and defines the style of the entire vessel. Black is the standard color, with others available upon request. The powder-coated Primus is made using a unified investment casting surrounding an integrated steel ring. It’s so incredibly strong, it easily exceeds ABYC P-22 and ISO 8848 standards, and comes with a lifetime warranty for corrosion and structural integrity. The marine grade 316L stainless steel is meticulously finished prior to powder coating. The result is a lustrous finish that’s impervious to weather, with little maintenance needed. Available in 13.5″ and 15.5″ diameters, the finger-grooved rim of the Primus is thicker than most others—a generous 1–1/8″ wide. Combined with UV-resistant black Santoprene™ rubber inserts that show through the top and bottom of the wheel’s rim, it provides utmost control, and delivers all-day cushioned comfort. It’s offered in three spoke patterns: solid, slotted and slotted with matching Santoprene inserts. Powder coated in the same attractive color as the wheel, the ergonomic control knob features corrosion-resistant glass ball bearings for trouble-free spinning. It’s mounted away from the outside edge of the rim to keep it from catching on clothing and gear. The powder-coated Primus comes with a 3/4″ tapered shaft. Its center nut fits all standard marine steering systems. 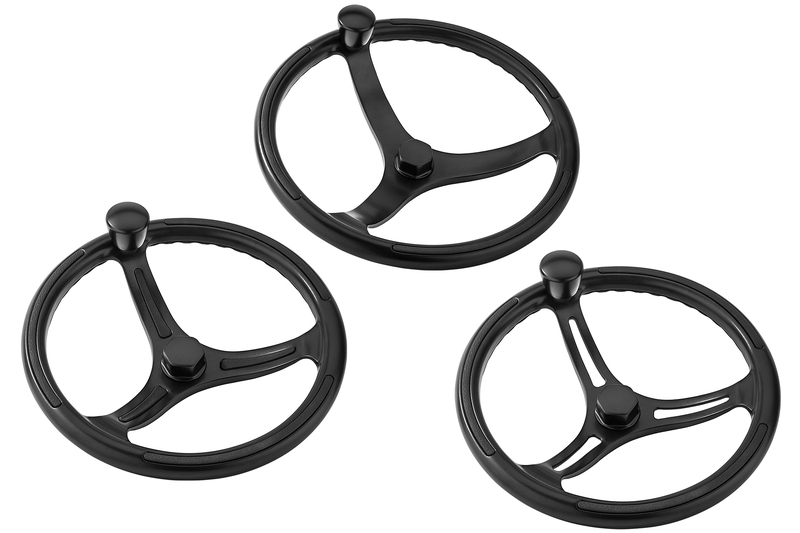 Like all Schmitt & Ongaro steering wheels, the powder-coated Primus may be customized by OEMs. A range of Santoprene colors are available, and the knob or center nut can be engraved with the boatbuilder’s logo. 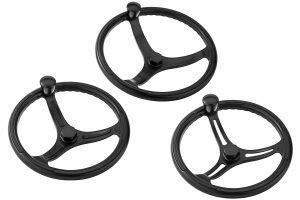 The 13.5″ Schmitt & Ongaro powder-coated Primus marine steering wheel is $710 to $787 MSRP; the 15.5″ model is $816 to $902. Contact Schmitt & Ongaro Marine Products, 1001 Ranck Mill Rd., Lancaster, PA 17602. 866-724-6488 (866-SCHMITT); Fax: 866-329-7679 (866-FAXSMSW). sales@schmittsteering.com. This entry was posted in News & Press Releases and tagged 316L stainless steel, Boat Accessories, boat parts, boating, durable wheel, marine steering wheel, powder coated, Primus, saltwater resistant, Schmitt & Ongaro, stainless steel wheel, UV resistant on February 7, 2019 by Lesa Lewallen.